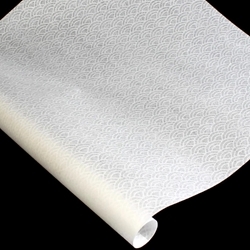 This Japanese Uminami Lace Paper is delicate and refined; perfect for many arts and crafts applications. The lacy, scalloped design of this paper makes it perfect for any application where you want translucency. See below for full product description and additional specifications. The Uminami Lace Paper features a beautiful lace pattern on traditional Japanese mulberry paper. This captivating wave-like design is created through a refined watermark process then backed with an ultra-thin sheet of white mulberry paper to create a solid sheet with translucent properties. Weighing 20 grams per square meter, the Uminami Japanese Lace Paper adds an intricate aesthetic and delicate texture to a variety of artistic creations!